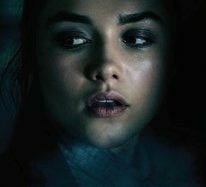 Angela (Florence Pugh) and Jackson (Ben Lloyd-Hughes) are two of the highest level crooks. They run a network of phantom ghost hunters operating in Scotland entering the homes their clients believe are haunted and “exorcised” by unwanted spirits. They have a very well-designed plan, including pre-recorded sounds or pre-recorded speeches to send spirits to the other world. Angela is not that excited about this activity, but Jackson owes a lot of money to dangerous people, so he’s desperate to get paid. They are convinced that they have found the client they need when called by a certain Mrs. Green (Celia Imrie), the owner of a former children’s home. Green thinks there’s a lot of evil spirits she wants to remove, and Angela and Jackson, not really believing in these “fairy tales”, go to the exorcism meeting and earn some money, but come to the scene that they have to do with more than they expected. Although their plan seems to go, they quickly understand that this is not a situation to be ridiculed, and that there is even some supernatural forces that threaten their lives even in them. Soon they are turning a charade into a continuous struggle for survival when the spirits do not want to leave themselves so easily out of the house they have been possessing for so long.